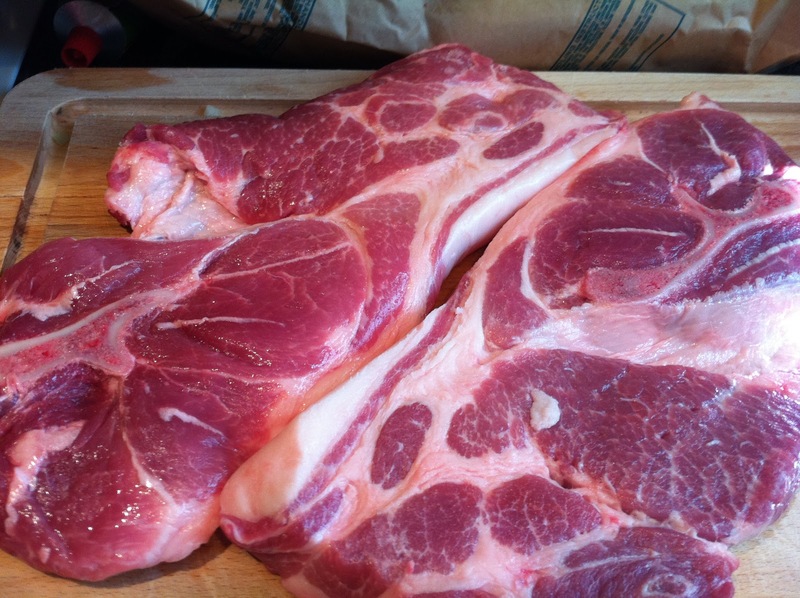 …Slabs of meat! 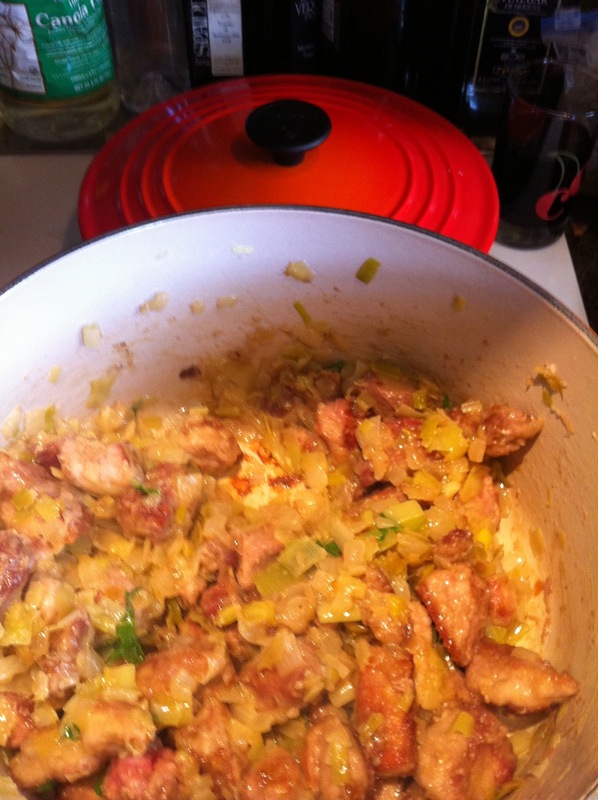 These piglets became a hearty Pork and wine sauce, stew, type thing. This has to simmer for several hours, so make sure you allot an appropriate amount of time for it or else it won’t meld properly. 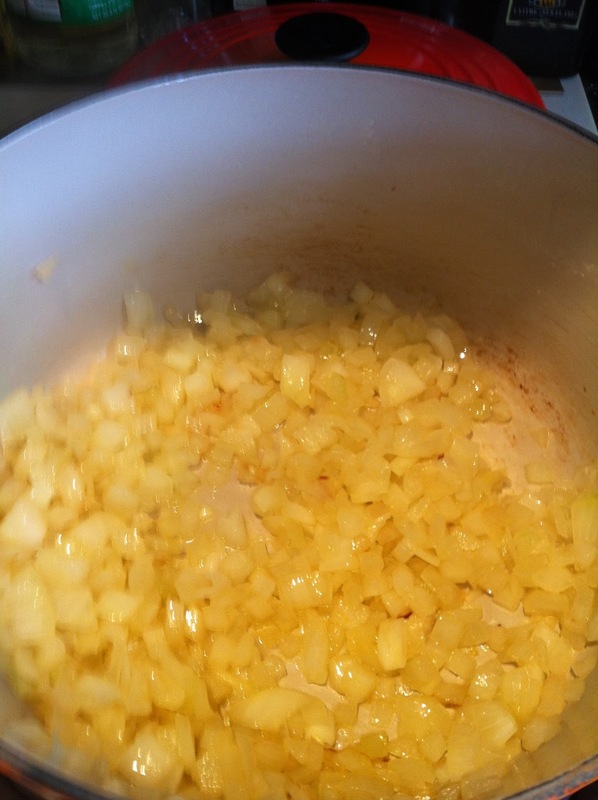 Finely chop your onion and add to a hot (medium heat) dutch oven or cast-iron pan with enough oil to thoroughly coat the bottom. 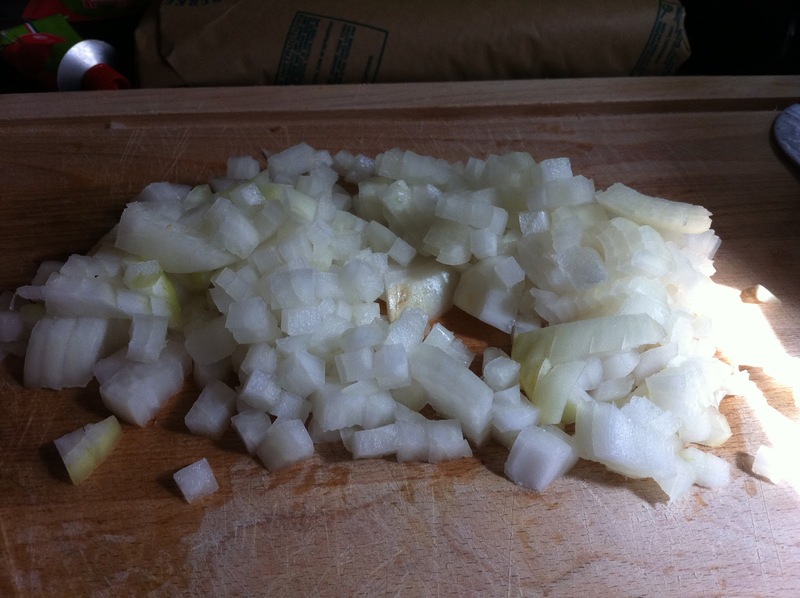 I must say I did a smashing job chopping this onion. Usually I’m a total spaz when I have to chop things into small, uniform shapes. I must have been channeling someone on Adderall. Finely chop and rinse very, very thoroughly. 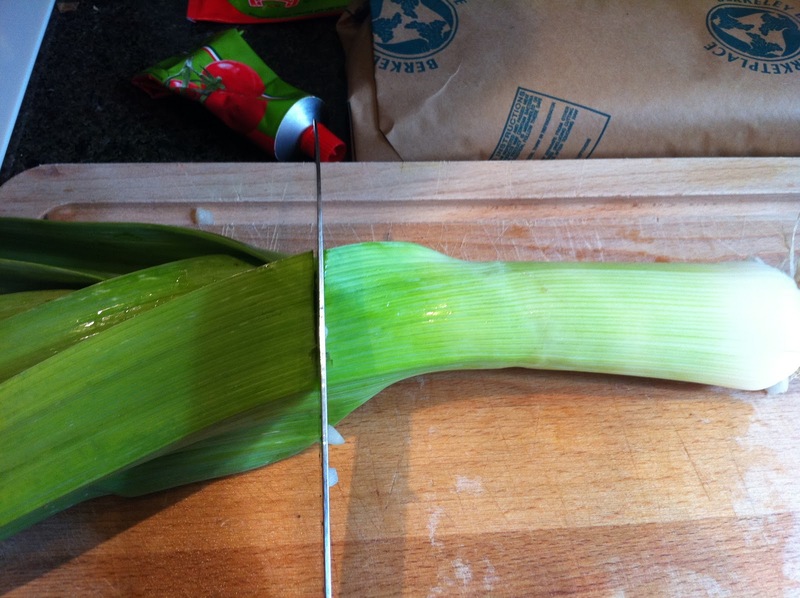 Leeks are pretty filthy when you shed the layers, so make sure you’re not too focused on the Tyra Show whilst performing this chore. 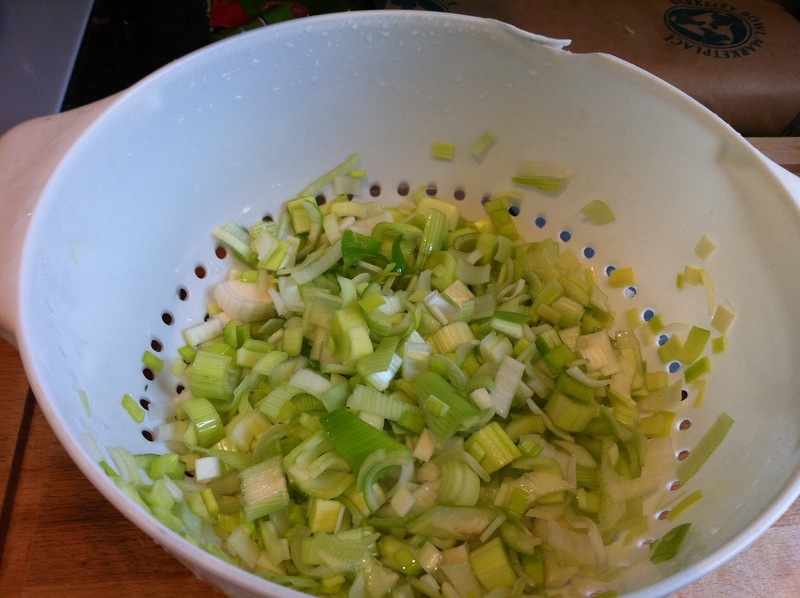 ie, soft and translucent, add the leeks. 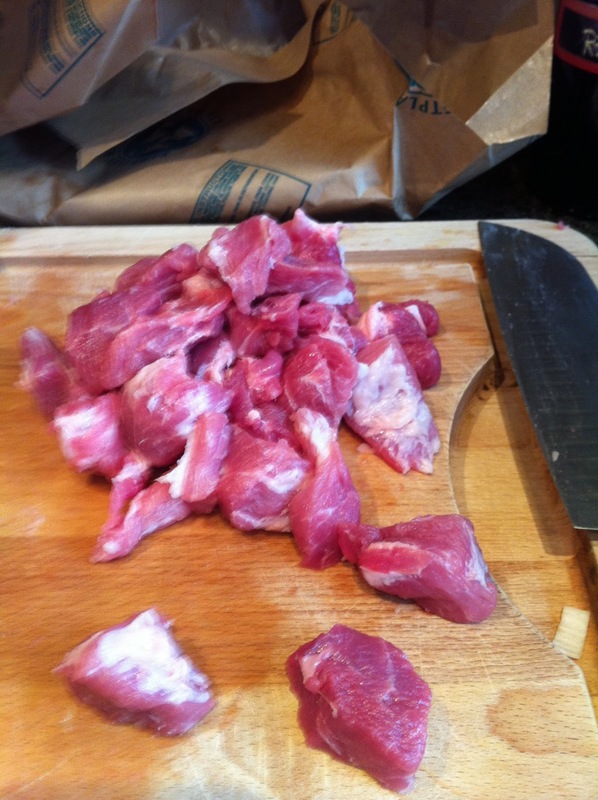 Turn the heat to medium low, but stir frequently while you’re preparing the pork. Prepare these puppies by trimming the fat and cubing them into whatever “bite-size” is to you. This takes awhile, since fat is a real SOB to get off the meat. I found that I fared better sometimes when I scraped with my knife instead of cut. 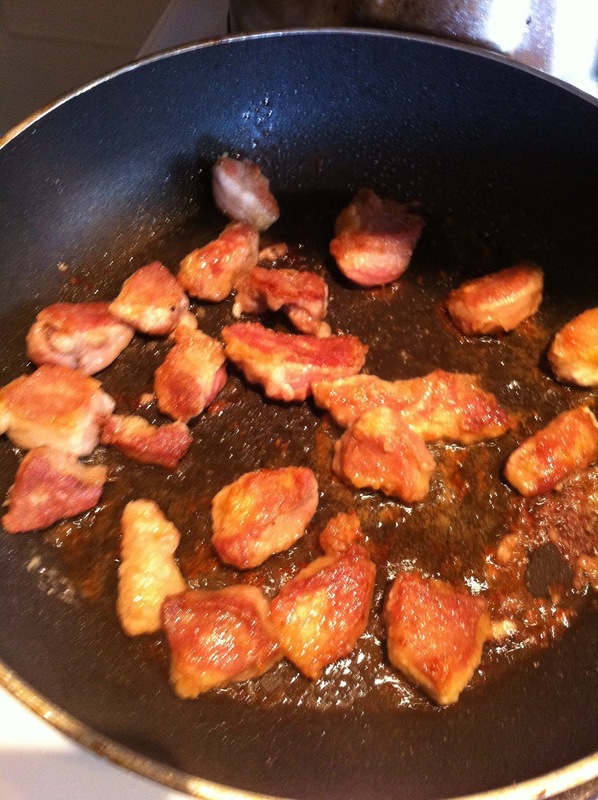 When you’ve got a nice pile of porky goodness, prepare a separate pan with some oil and place over medium high heat. 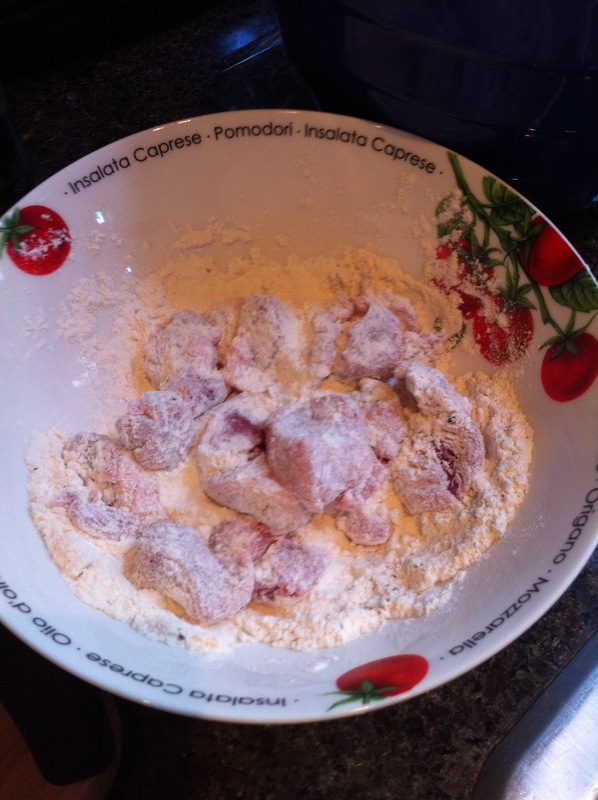 Place flour in a wide, shallow bowl with a bunch of salt and pepper (approx 1 t each). 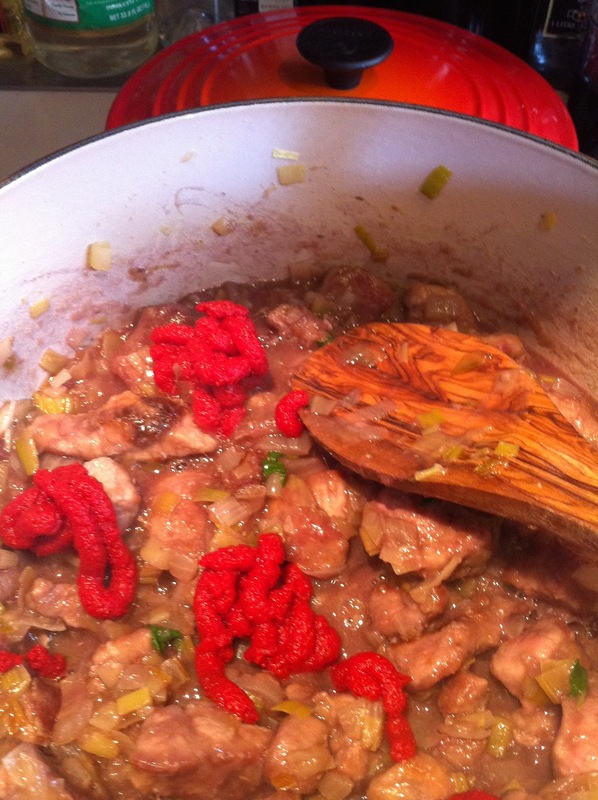 Coat your meat chunks thoroughly and shake any excess flour off before adding it in batches to the hot pan. 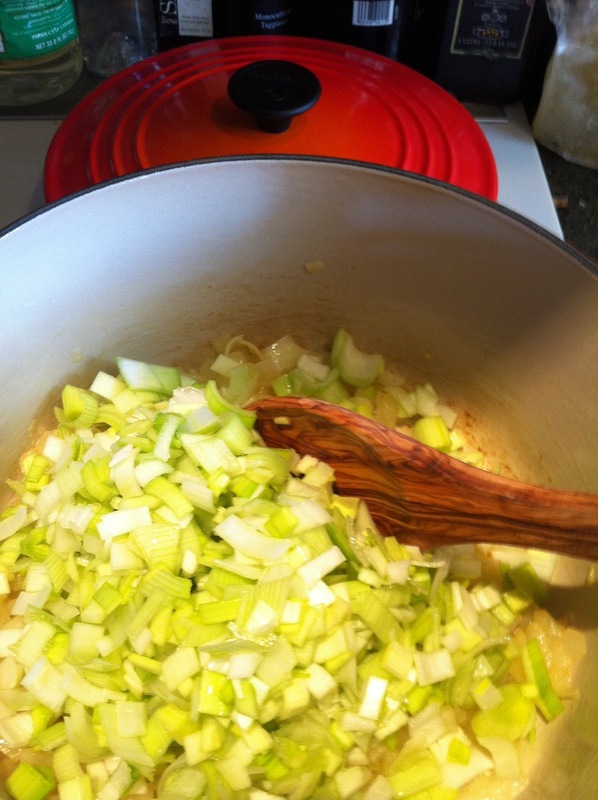 Brown it on both sides, then add to the onion/leek mixture (which you should be stirring periodically and keeping over low heat!). 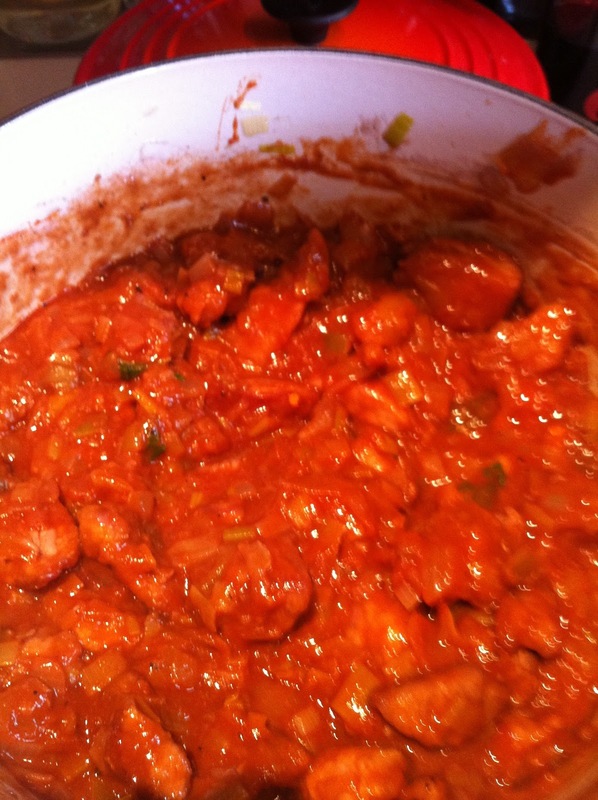 I had to do three batches to get all of the pork browned and added to the pot. 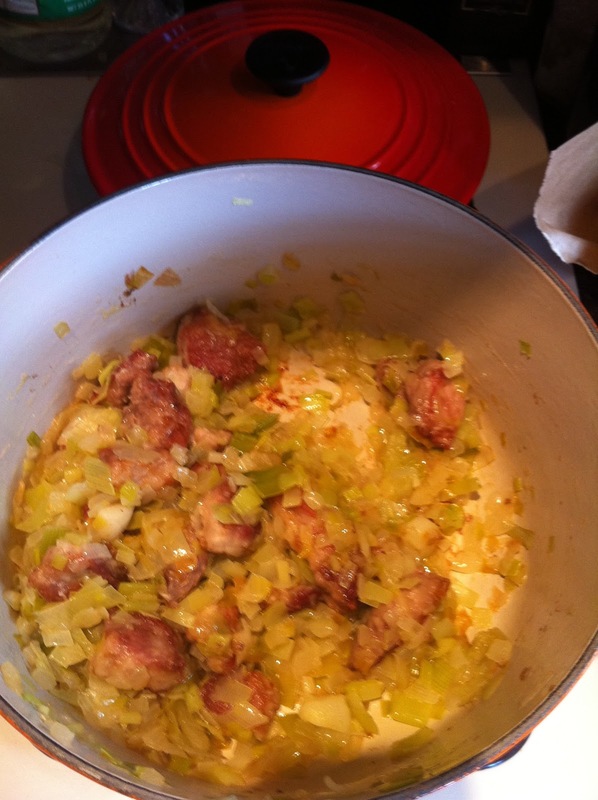 When it was done, the leek/onion mixture was very soft and fragrant, but not brown. 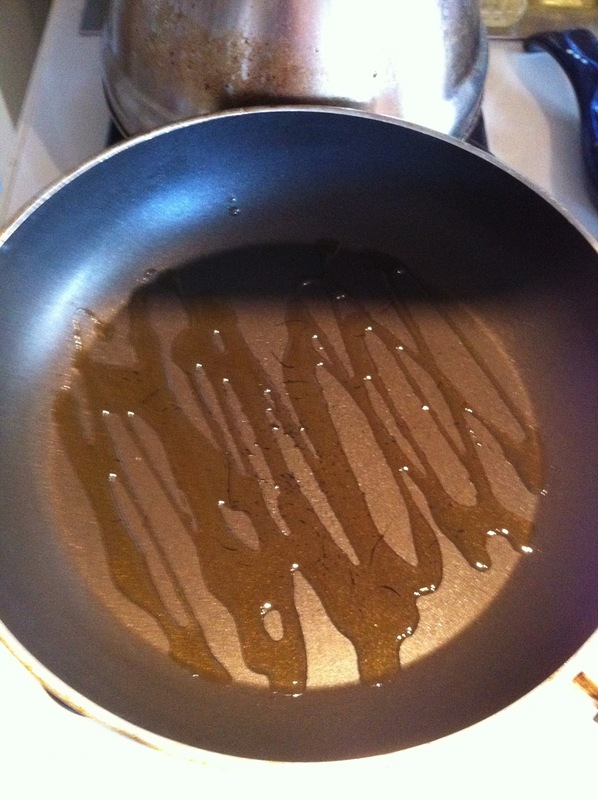 It’s very important to stir this periodically and to add enough oil initially, or else it will burn. 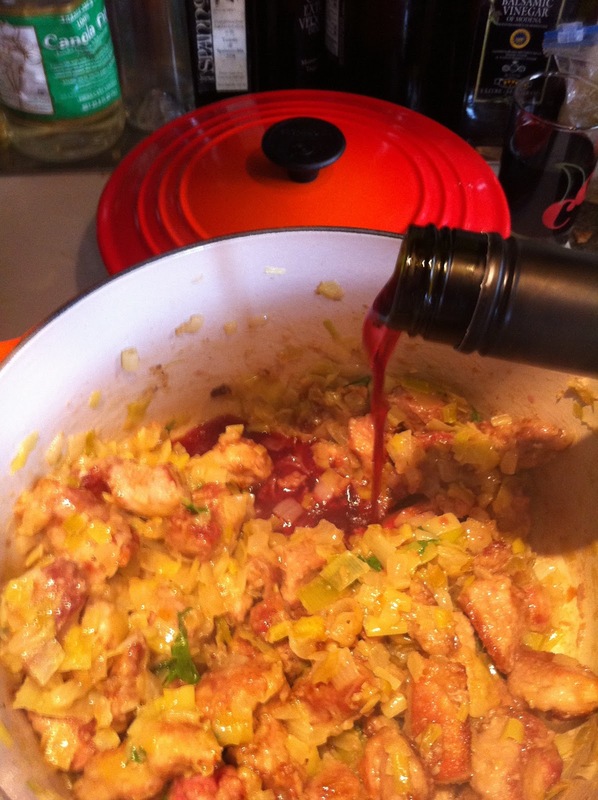 Push everything to the side and slowly add the wine, scraping any brown bits from the bottom of the pan as it deglazes. 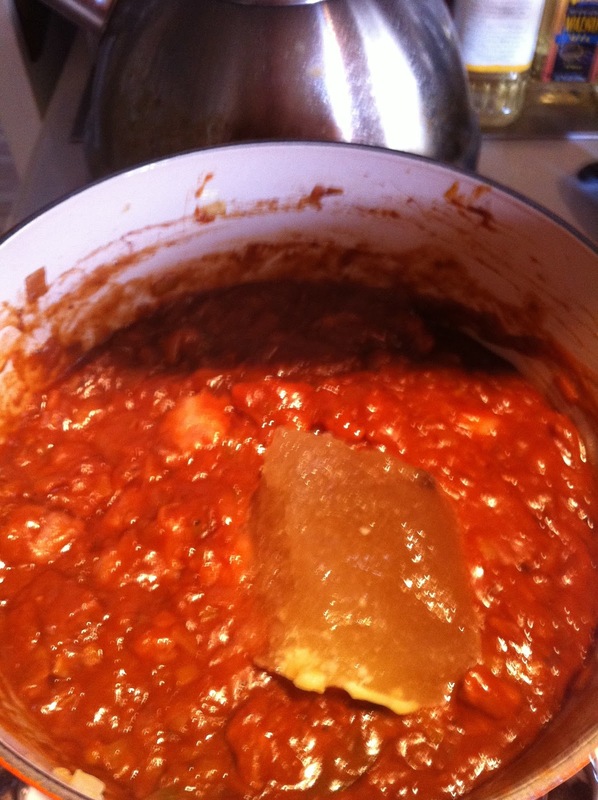 I had some stock frozen, which is why it is in a solid state…. You should also throw in some extra salt, pepper, the chili flakes, and bay leaf. Now comes the magical part. 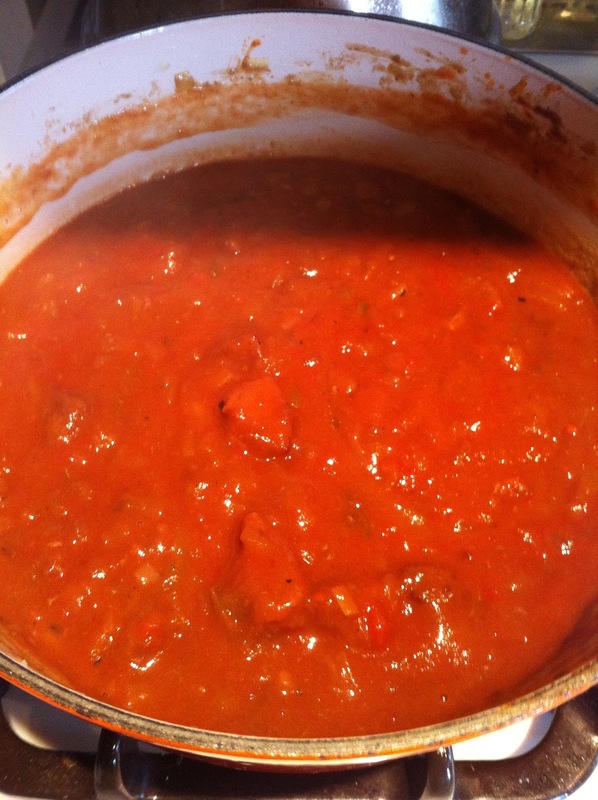 Turn this down to low and cover, letting it simmer for a few hours. You will need to stir it frequently, or else it will stick and burn on the bottom. 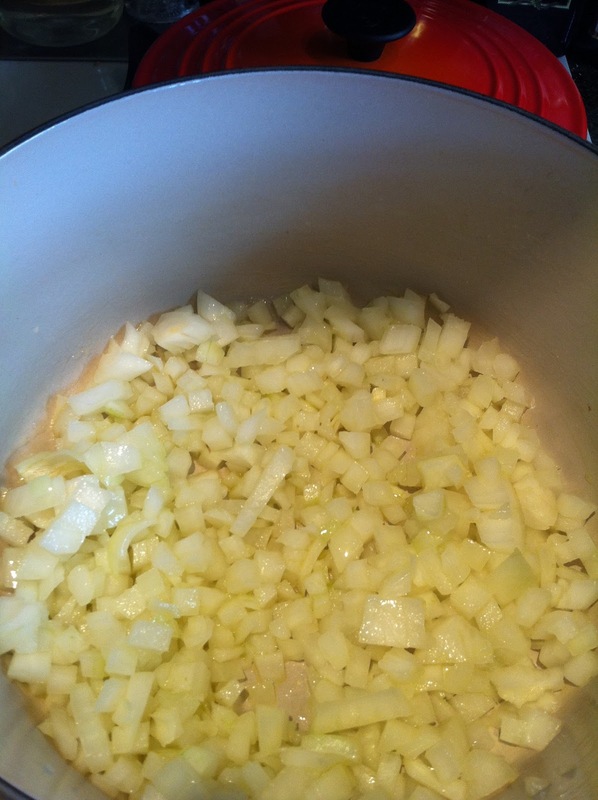 It will start to smell absolutely fantastic and look better and better. 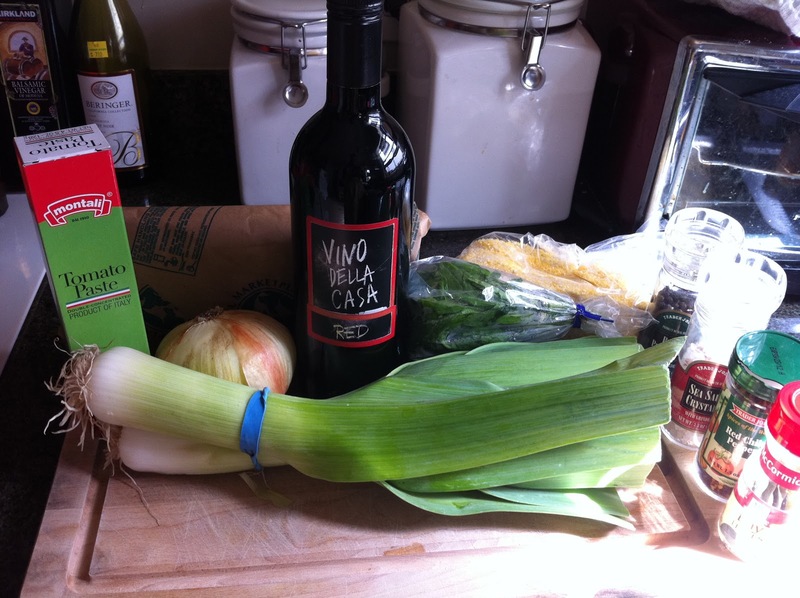 Feel free to add more wine, tomato sauce, stock, whatever suites your fancy. I found myself adding dashes of things here and there, depending on how the flavor was moving along. And let me tell you….it turned out simply magical! I cooked up some polenta to go with this pile o’pork. I love this stuff and feel that it was a creamy, more comforting alternative than pasta. 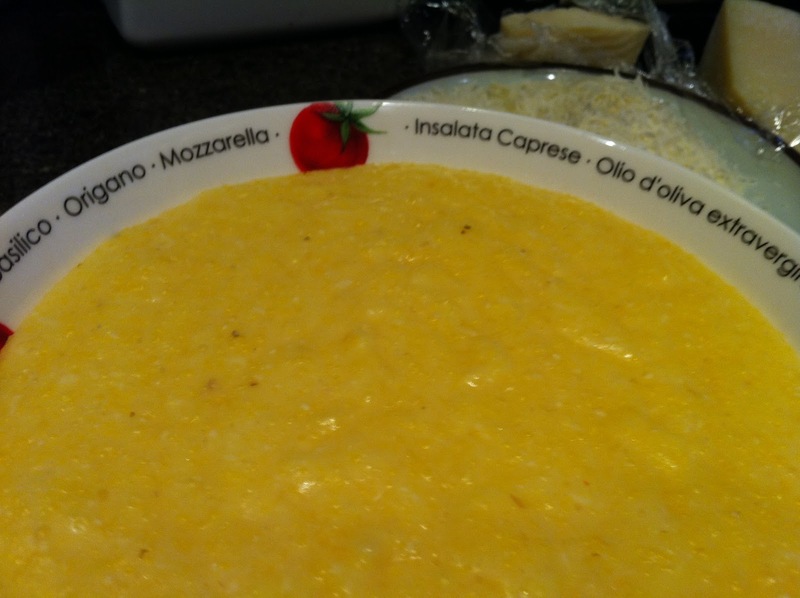 Polenta is also a great way to “hide” healthy bits of nom without your guests being any the wiser. 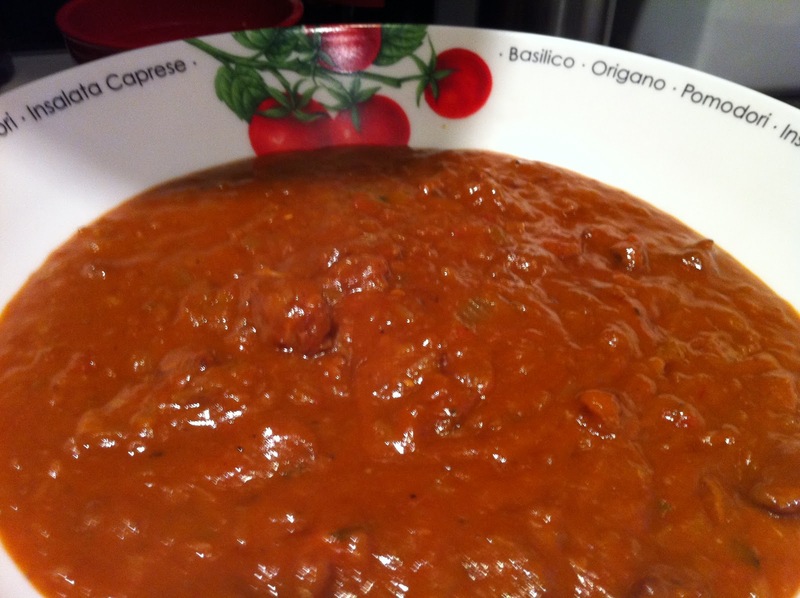 Pureed spinach, some flax meal, or fresh arugula stirred in would be magnificent additions. We enjoyed this with a nice salad and a fabulous carrot cake, baked up by my friend Adriana (she’s the real deal, peeps. Culinary school grad, woot woot!). It was all amazing, so dive in!